Foof is my fourth child, she was a feisty little girl, running around the compound playing, refusing to brush her hair or wear socks the year she attended the American school. She went to Arabic school through Junior High and was then home schooled. When we relocated to the United States (2009) she took a job at a local restaurant and worked on passing her GED. She had never worked before and although totally American, knew little of U.S. history, government or the tiny things we all take for granted in our education. She struggled to pass the GED, not knowing these basics made it seem impossible. She persevered and made it happen. The next hurdle was getting into University and with no G.P.A., less than amazing test scores, again she faced what seemed insurmountable. She enrolled part time, studied hard and got two A’s. Finally she was accepted to University where the real work began. I kept telling her “Wait until you are holding that diploma, it will be worth it” and it finally happened. Last May, Foof (Fattima) graduated and as she stood on stage in her bright orange heels, I held back tears that I knew, if left to fall, would lead to a huge scene of sobbing! This is a quick meal that Foof has put together on many lazy days and the kids just love it. There is little work involved and a great outcome, it actually seems like more of a suggestion, not really a recipe! You can put anything in wraps and experiment with ingredients that fit your taste, obviously the combinations are endless. I made teriyaki chicken the last time she made wraps and so we decided to shred some of the chicken and give it a try. I like wraps because they are easy and have the potential to be a lovely vegetarian treat, with bell peppers, onions and pesto or a meat lovers meal with shredded beef or chicken. Anyway you put this together it is delicious and easy! Bbq sauce or Pesto or Ranch or……. 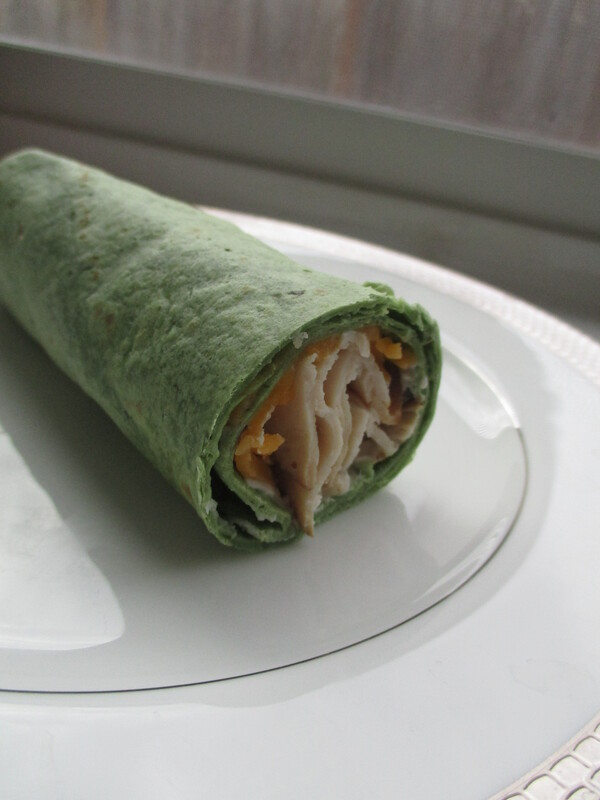 What we used – We used Spinach and Sun dried Tomato wraps, turkey, shredded teriyaki chicken and tons of veggies in our wraps. We also used cheddar cheese and pepper jack. Foof uses a mixture of cream cheese and mayonnaise on her wraps but you can pick any sauce that you like. Have fun and experiment! Lay wrap flat and spread a spoon of sauce on one side, place ingredients over sauce, roll up tightly. Wrap sandwich up in foil and place in oven to warm and melt cheese. After 5 minutes remove from oven and serve.